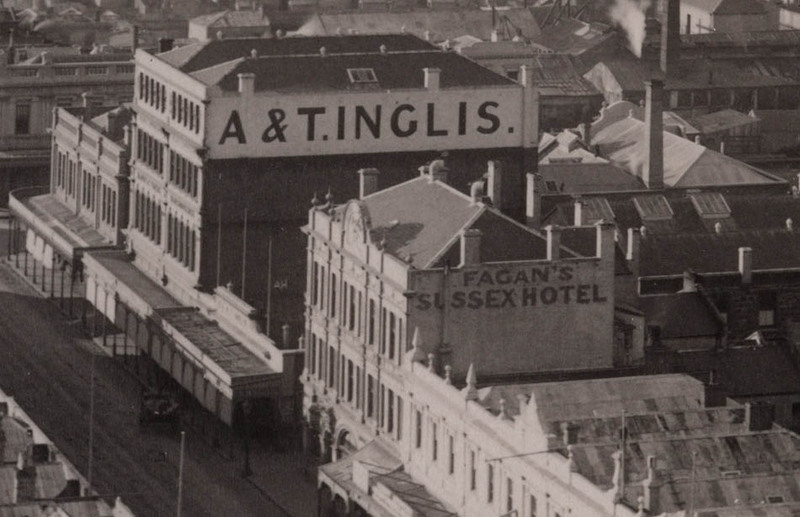 Tag Archives: Barningham & Co. 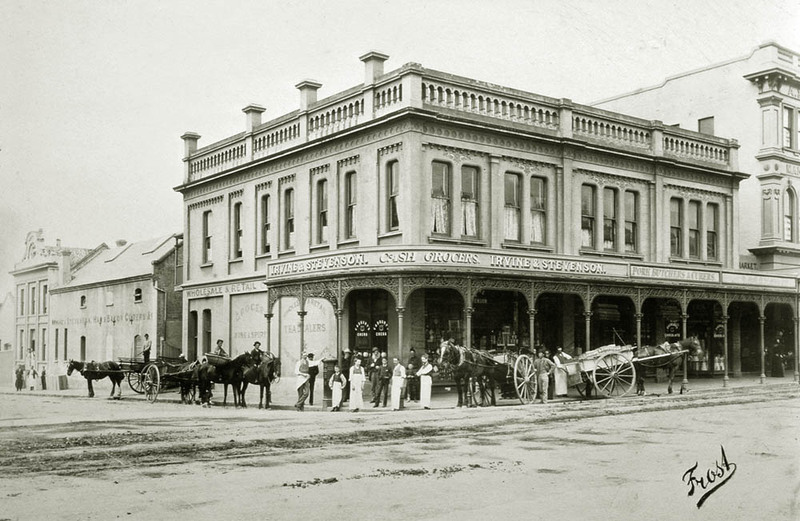 The foundry as it appeared from George Street in the 1880s. Ref: Field and Hodgkins family photographs, Alexander Turnbull Library, PA1-q-079-07. 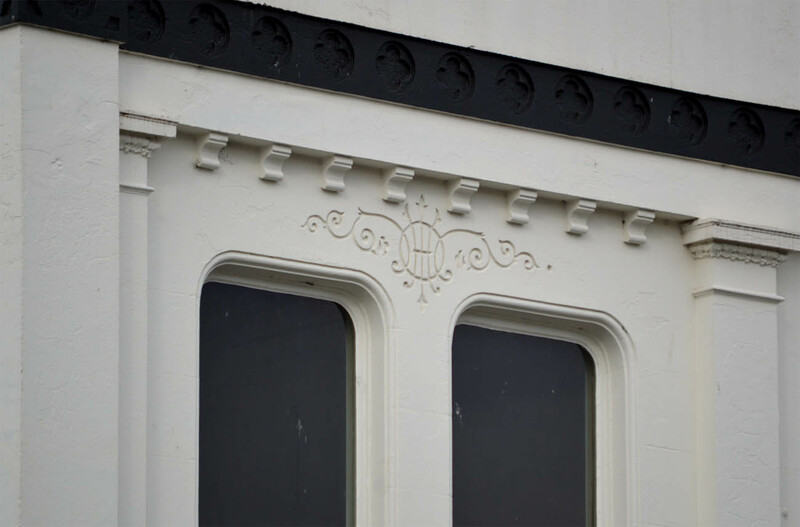 The plain facade of a popular George Street eatery was once the exuberantly decorated front of the Victoria Foundry. 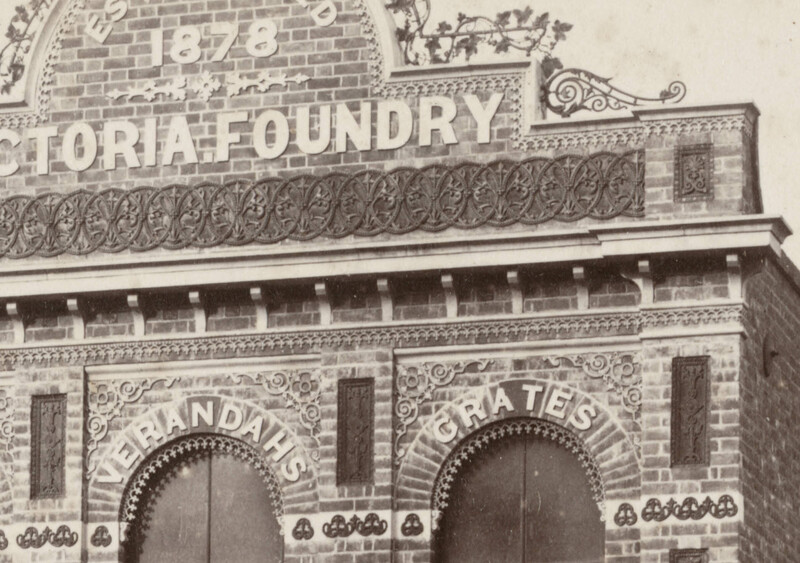 A nineteenth-century photograph shows decorative cast iron set in and otherwise attached to neat, exposed brickwork, promoting products produced by Barningham & Co. in the buildings behind. The premises lately known as the Railway Foundry [established in 1871] are now occupied by a company of ironworkers, who, under the style of Barningham and Co., have commenced the manufacture of ornamental ironwork of every description, particularly that used in the construction of balconies, etc. Hitherto it has been difficult to obtain this description of ornamental ironwork, except from Europe or Melbourne, and consequently our architects and builders were in a great measure deprived of one of the most pleasing adjuncts of their art. This want may now be supplied. The firm have just completed their first order, a verandah and balcony for Mr G.H. Madden, which is certainly a handsome piece of work. 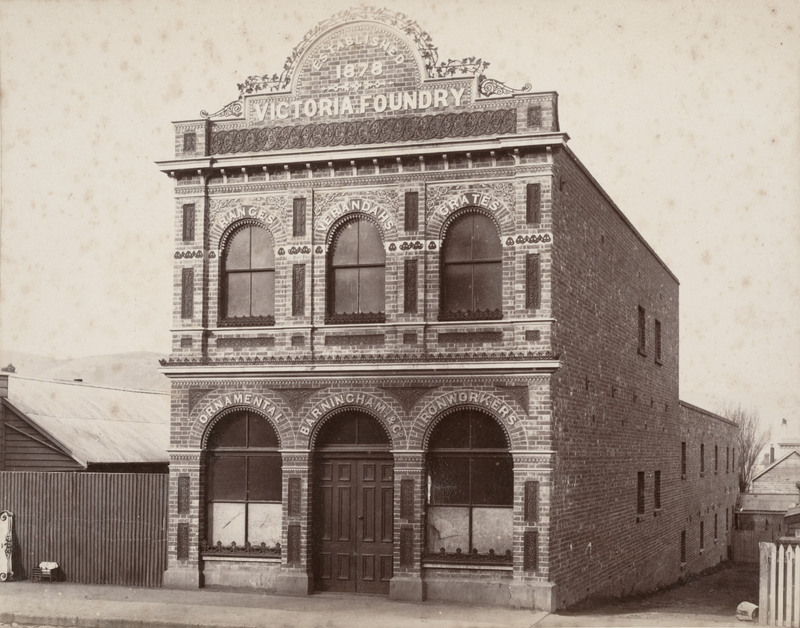 In the second half of 1883, the foundry took a site fronting George Street, and rates records indicate that new buildings were erected at this time, while Barningham also bought three adjoining houses and a shop. 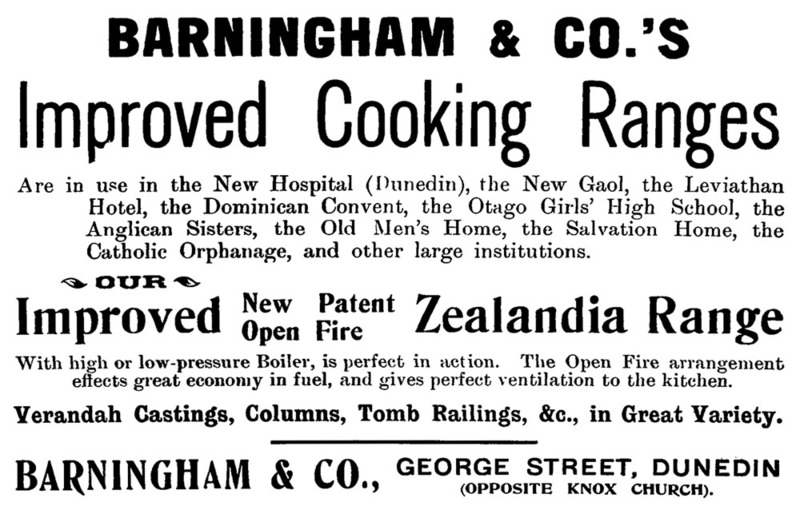 Barningham & Co. produced the ‘Zealandia’ cooking ranges with patented designs for draught supply and regulation, and they were sold throughout New Zealand, competing strongly with the Orion ranges manufactured by rival H.E. Shacklock. 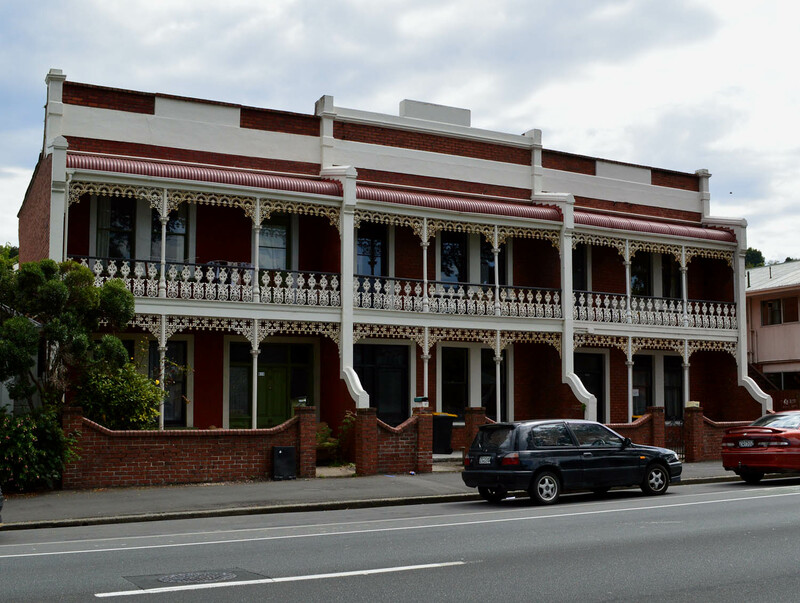 Examples of decorative ironwork made by the foundry can still be seen on many Dunedin buildings, including a terrace of houses at 618-626 Great King Street (built 1903-1904). Among the foundry’s most elaborate productions were gates and railings designed by Louis Boldini for the second synagogue in Moray Place (consecrated in 1882 and demolished in 1971). 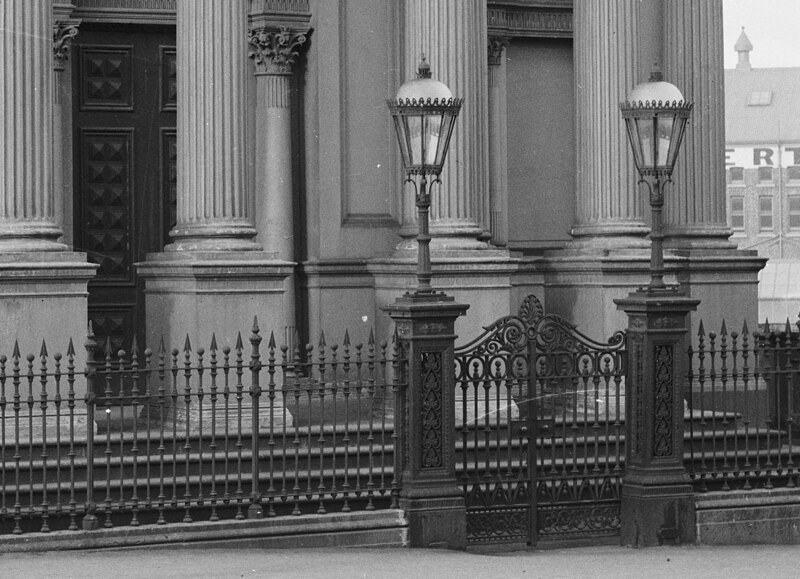 Gates and railings on the synagogue in Moray Place, designed by Louis Boldini and manufactured by Barningham & Co. Detail from Muir & Moodie photograph, ref: Te Papa C.012193. 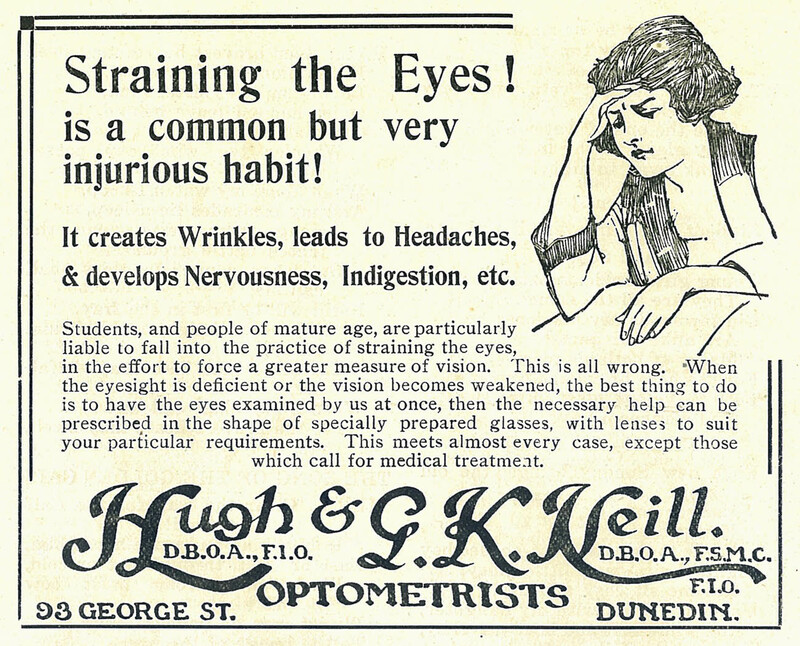 Advertisement from the Otago Witness, 21 December 1904 p.35. 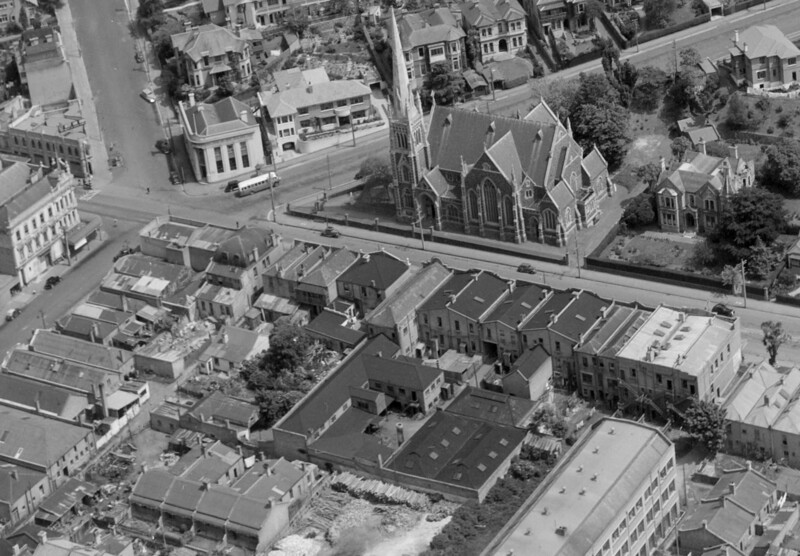 An aerial view from November 1947 showing the foundry complex (with dark coloured roofs near the centre of the image, behind the buldings facing the street). Detail from White’s Aviation photograph, ref: Alexander Turnbull Library WA-10679\F. Sam Barningham, a good-humoured man of ‘ever genial and kindly qualities’, died in 1911 but the foundry continued to operate until 1951. Shop fronts to George Street had been installed in 1914, and in 1942 Robert MacFarlane opened a fishmongers behind one of them. This changed hands several times over the next decade, and around 1951 it was taken over by Yuen Kwong Chin, a migrant from Canton in China. He operated the business as the George Street Fish Supply, and a few years later it passed to his son, Poy Seng (Bill), and daughter-in-law, Cole Woon. The fish shop closed in 1971, when the Chins opened the August Moon Restaurant and an adjoining ‘burgers and meal bar’. The restaurant was panelled in dark timber contrasting with white facings and ceilings, and further decorated with red and gold wallpaper, and a large hand-carved camphor wood wall panel imported from Hong Kong. 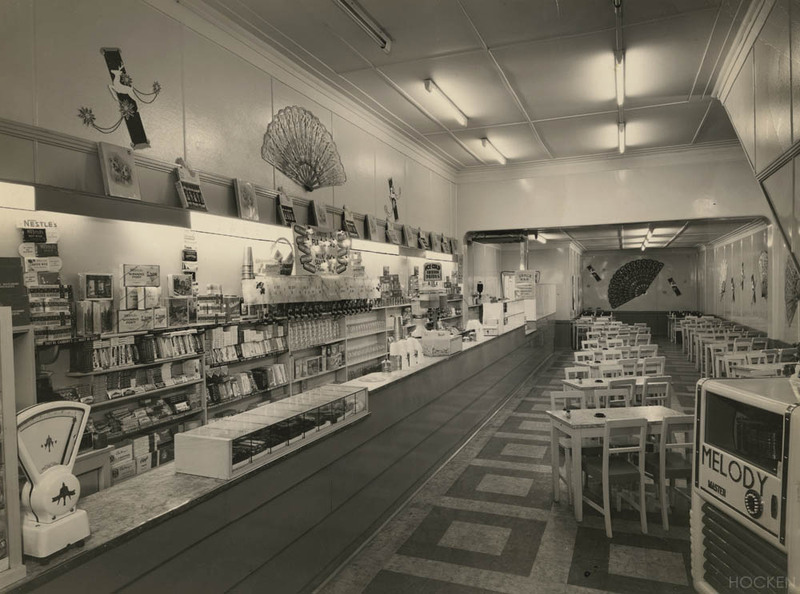 In 1976 Mr Chin said the restaurant was attracting more and more tourists, particularly Americans, while it was also popular with Malaysian and Chinese students studying at the University. 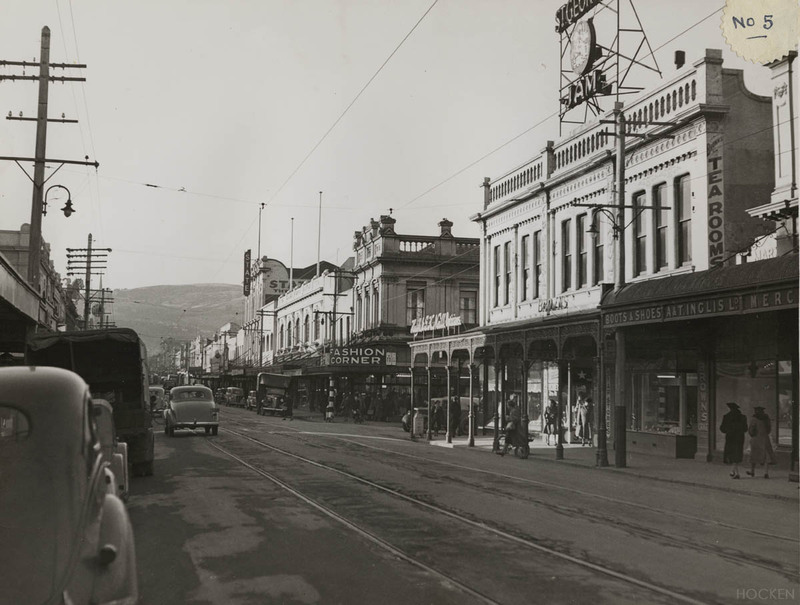 There was growing general demand for traditional Chinese and Indonesian cuisine that had not been readily available in Dunedin, and full Chinese meals with up to ten courses were made available. 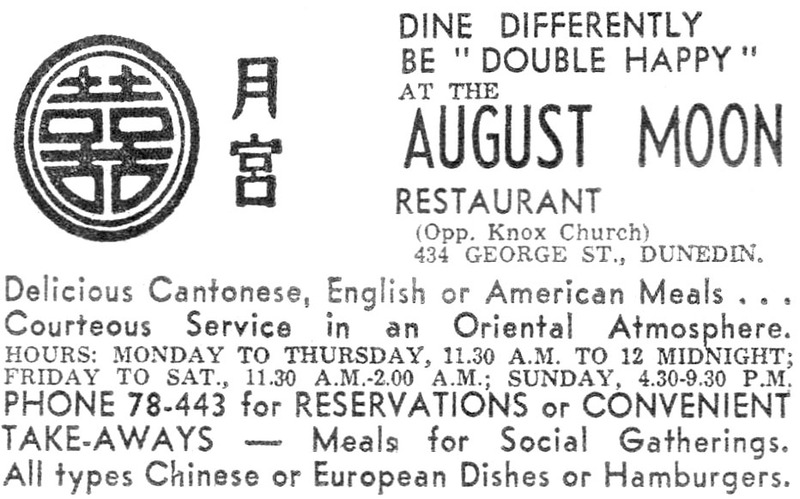 A 1972 advertisement for the August Moon Restaurant, courtesy of Owain Morris. In 1986, Sui Ching and Pik Hung Yip transformed the August Moon into the Phoenix Chinese Restaurant and associated takeaway. 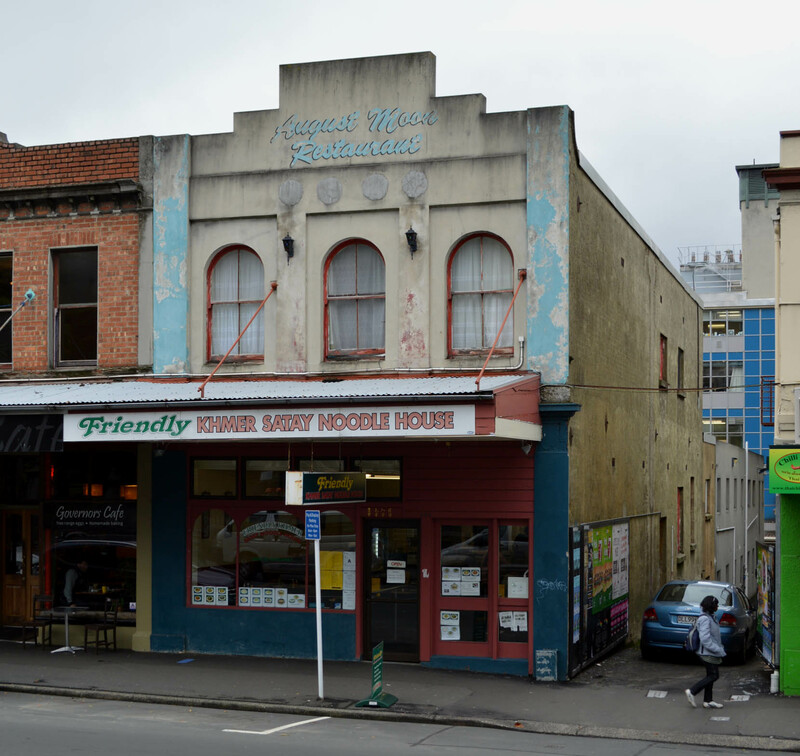 Chinese curries and tofu dishes were specialties, and the takeaway was one of the first in Dunedin to sell tofu burgers. The Phoenix was refurbished in 1993 and closed in 2001, when it was replaced by the Friendly Khmer Satay Noodle House. The new restaurant’s founder, Hain Seng (Hamish) Te, arrived in New Zealand from Cambodia in 1979, and began selling chicken and beef satay from a stall in the Octagon in 1988 before opening his first Khmer Satay Noodle House in 1991. Khmer Satay Ltd grew to establish a chain of restaurants throughout New Zealand (many now owned independently) and its Satay peanut sauce and a meat marinade are widely sold in supermarkets. 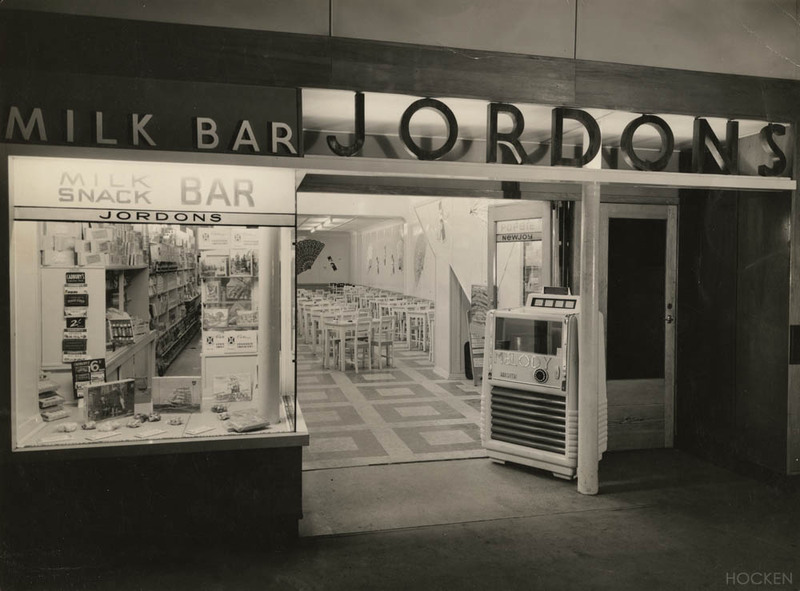 As these stories demonstrate, a theme throughout the history the building is one of creative and industrious migrants finding success in business, whether they be from Yorkshire or Canton, or working as engineers or restaurateurs. 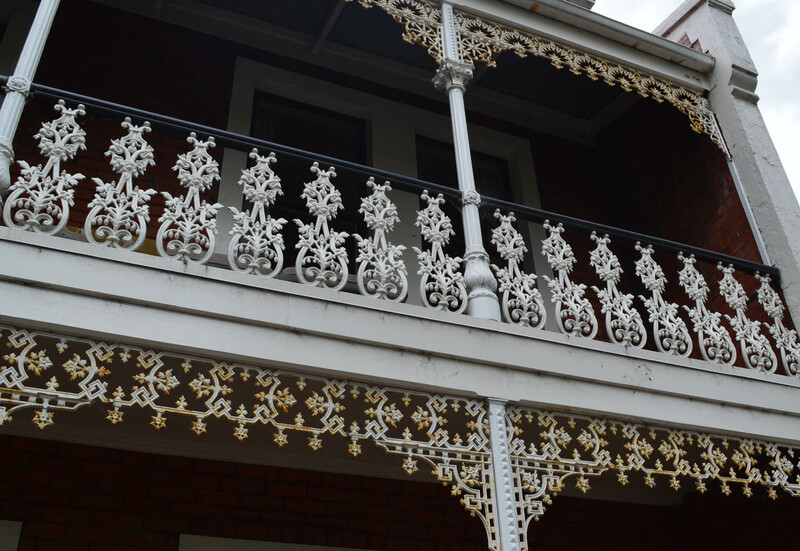 It is unclear how long the ironwork remained visible on the facade, but a verandah was added at a relatively early date and later replaced. A permit for plastering the exposed brickwork was issued in 1954, and it was likely round this time that the original arched pediment was reformed as a square one. A bracketed stone cornice remained in place until the early 1980s. 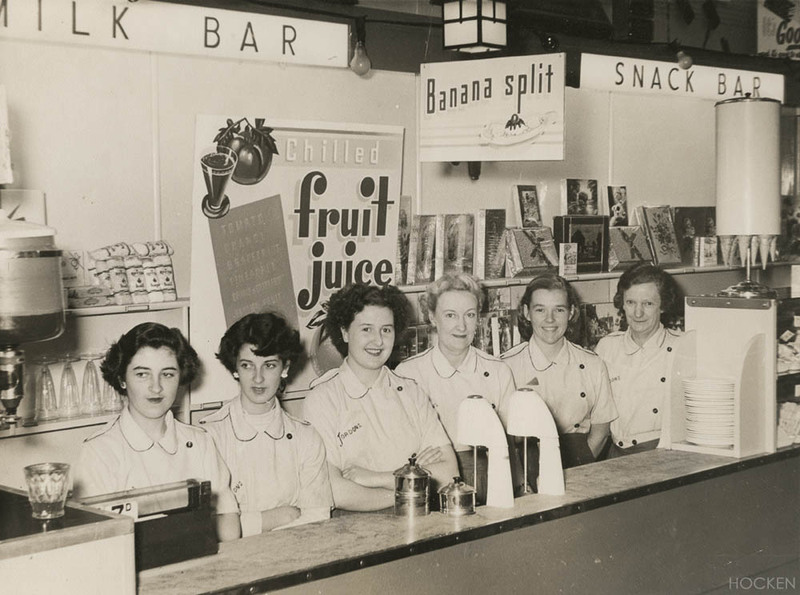 Much of the foundry complex behind the George Street building has been demolished but the largest portion survives and was occupied for some years by the University of Otago Pharmacy Department. 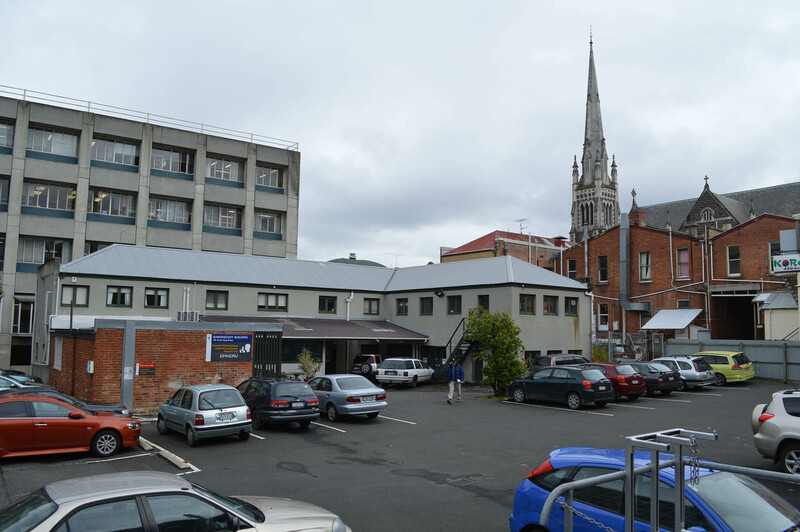 It is now known as the Barningham Building and has housed the Dunedin Multi-Disciplinary Health and Development Unit since 1985. The University of Otago’s Barningham Building. Bruce Herald, 22 February 1871 p.2 (Railway Foundry); Otago Daily Times, 3 December 1878 p.3 (advertisement), 17 June 1881 p.6 (elaborate railing for synagogue), 2 September 1911 p.14 (obituary for Samuel Barningham), 16 May 1934 p.14 (description of Barningham & Co.), 28 July 1971 p.11 (opening of August Moon), 18 August 1976 p.15 (fifth anniversary of August Moon), 4 March 1985 p.2 (Dunedin Multi-Disciplinary Health and Development Research Unit), 21 July 1993 p.10 (Phoenix Restaurant), 15 November 2004 p.20 (Khmer Satay), 17 October 2009 p.50 (‘Stories in Stone’ biography of Samuel Barningham), 10 August 2013 p.7 (Khmer Satay); Otago Witness, 4 January 1879 p.20 (Zealandia ranges), 19 June 1880 p.18 (Zealandia ranges); Clutha Leader, 7 September 1883 p.4 (advertisement with new address). 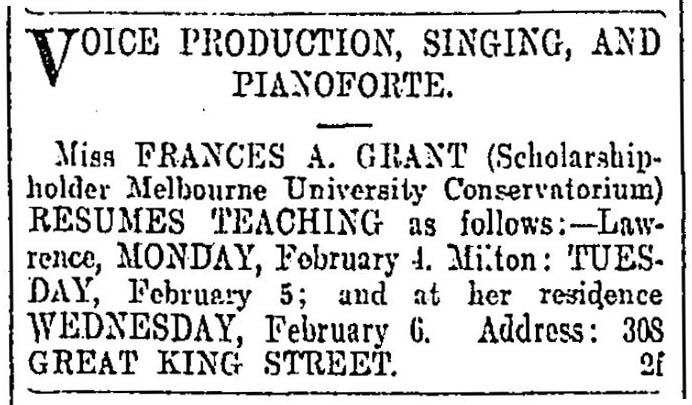 Thanks to Papers Past, National Library of New Zealand, for the pre-1920 references. 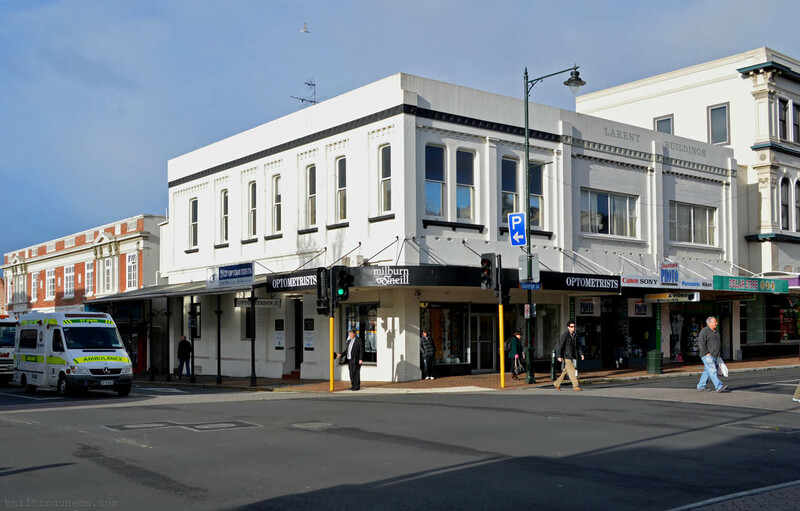 A version of this story was published in the Otago Daily Times, 21 February 2015. 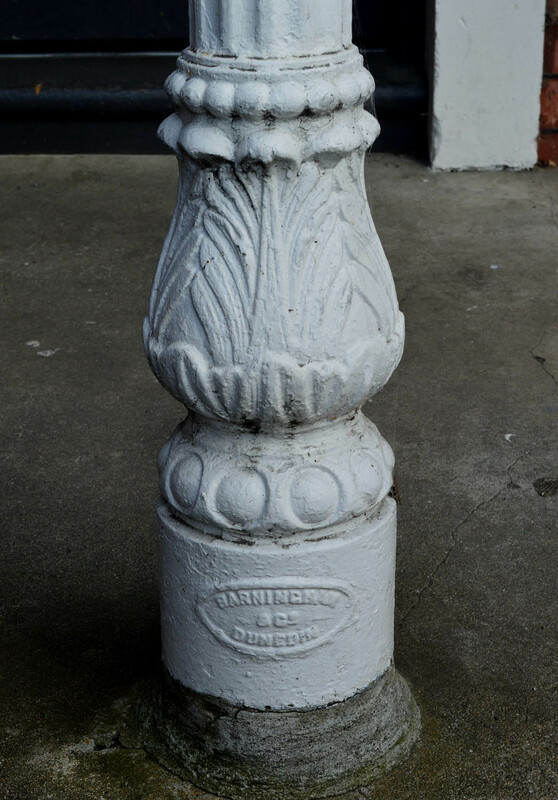 This entry was posted in Buildings and tagged 1880s, August Moon, Barningham & Co., Chinese Community, Foundries, George Street, Industrial buildings, Khmer Satay, Phoenix, Restaurants, Samuel Barningham on 22 February 2015 by David Murray.